This is what the Lord God showed me: a basket of summer fruit. He said, "Amos, what do you see?" And I said, "A basket of summer fruit." Then the Lord said to me, "The end has come upon my people Israel; I will never again pass them by. The songs of the temple a will become wailings in that day," says the Lord God; "the dead bodies will be many, cast out in every place. Be silent!" Hear this, you that trample on the needy, and bring to ruin the poor of the land, saying, "When will the new moon be over so that we may sell grain; and the Sabbath, so that we may offer wheat for sale? We will make the ephah small and the shekel large, and practice deceit with false balances, buying the poor for silver and the needy for a pair of sandals, and selling the sweepings of the wheat." The Lord has sworn by the pride of Jacob: "Surely I will never forget any of their deeds. Shall not the land tremble for this, and everyone mourn who lives in it, and all of it rise like the Nile, and be stirred and sink again like the river of Egypt? "On that day," says the Lord God, "I will make the sun go down at noon, and darken the earth in broad daylight. I will turn your feasts into mourning, and all your songs into lamentation; I will bring sackcloth on all loins, and baldness on every head; I will make it like the mourning for an only son, and the end of it like a bitter day. "The days are surely coming," says the Lord God, "when I will send a famine on the land; not a famine of bread, or a thirst for water, but a famine of hearing the words of the Lord. They will wander from sea to sea, and from north to east; they will run to and fro, seeking the word of the Lord, but they will not find it. In that day the beautiful young women and the young men will faint for thirst. Jesus told them another parable: "The kingdom of heaven may be compared to someone who sowed good seed in his field; but while everyone was asleep, an enemy came and sowed weeds among the wheat, and then went away. So when the plants came up and bore grain, then the weeds appeared as well. "But he replied, 'No; for in gathering the weeds you would uproot the wheat along with them. Let both of them grow together until the harvest; and at harvest time I will tell the reapers: Collect the weeds first and bind them in bundles to be burned, but gather the wheat into my barn.' "
"While everyone was asleep, an enemy came and sowed weeds, and then went away," symbolizes that while we are living a worldly and materialistic life, evils from hell secretly introduce false ideas into us while we are unconscious of it. . . . "When the plants came up and bore grain, then the weeds appeared as well," symbolizes that when truth increases and brings forth good things, false ideas from evil are mixed with them. . . . "The slaves said to him, 'Do you want us to go and gather them?'" symbolizes the separation and removal of false ideas that come from evil before the true ideas that come from goodness are accepted and grow in us. "But he replied, 'No; for in gathering the weeds you would uproot the wheat along with them' " symbolizes that in this way truth that comes from goodness, and its increase, would also perish. For true ideas are mixed with false ones among Christians; and these cannot be separated and the false ideas rejected until we are spiritually reformed. We are now solidly in the time of Lent--a period of forty weekdays before Easter traditionally set aside for repentance and self-denial. And it just so happens that today we have our final lesson from the Old Testament for this church year. That lesson is from the book of Amos, who did the prophets proud with his messages of gloom and doom, alleviated here and there by a ray of hope and promise. So today I'll fulfill my prophetic duty and do some afflicting of the comfortable; and next week, as we move into the New Testament, Kelly will have an opportunity to comfort the afflicted. But seriously, we do need to take stock of our lives from time to time. As Swedenborg points out in his theological style of speaking, it is easy for us to fall asleep spiritually. It is easy to find ourselves just drifting along, absorbed in the concerns and the values of this world. It is easy to forget that we are here for a higher, spiritual purpose as we struggle just to keep up with all the daily demands that this life continually throws at us. And as Swedenborg also points out, when we drift along on the material level like this, we pick up a lot of false notions along the way; false notions that come from our tendency to be absorbed primarily in ourselves and the material world; false notions that get mixed in with our good intentions, so that pretty soon, even though we began our spiritual life with the good seeds of truth sown in the soil of our minds by the Lord, as we live out our lives we find that the stalks of wheat are hopelessly mixed up with the weeds of our own faulty ways of thinking, feeling, and acting. We become fields of wheat and weeds so thoroughly entangled with one another that there seems little hope of straightening our lives out. While we have many good intentions and do many good things, we remain addicted to attitudes and behaviors that are busily tearing down everything our better self is working so hard to build up. If we have our stubborn sins that we can't quite seem to repent of, we are not alone. One of the modern sports of journalists and historians is to dig up dirt on all the leading figures in our history and in our current society. It can be upsetting to hear that the heroes of history that we were taught in school to revere turn out to have had clay feet. From our country's founding fathers--Washington, Franklin, Jefferson, and so on--to more recent figures such as Gandhi, Martin Luther King, and Kennedy, we find out that indeed, "We all, like sheep, have gone astray; each of us has turned to our own way" (Isaiah 53:6). We don't like to hear the dirt about the great figures we have looked up to for inspiration. We may even become angry with the historian or journalist who has the gall to unearth some sexual misdeeds or shady dealings or oppressive action or other hypocrisy in our particular heroes. And yet, assuming that the character flaws thus unearthed are real, to get angry at the ones who unearthed them amounts to killing the messenger who carries bad news. The fact is, not a single human being, no matter how great in the eyes of society, has ever been perfect. As Jesus said, "No one is good except God alone" (Mark 10:18). And as annoying and even painful as it may be, the positive side of muckraking is that it reminds us of this fact: we humans are imperfect and fallible; there is always evil mixed in with the good in us. Of course, recognizing that even the greatest leaders among human beings have their dark side does not mean we can just relax and not worry about our own sins--which sometimes seem much smaller by comparison. Of course, we are meant to deal with one another and with ourselves not only with a critical mind, but also with a merciful heart. Yet we shouldn't be so "merciful" as to say, "Well, if Thomas Jefferson or Martin Luther King could do it, I guess it's okay for me to do it." Because every one of us, from the least to the greatest, will one day have to answer for the wrongs we have thought, said, and done. And though we may still end out in heaven, those wrongs will have had their damaging effects, both on our own souls and on the souls of those people around us who have been at the receiving end. As long as we continue to live on this earth, we are never "off the hook" when it comes to the need to face our own sins, admit them, take responsibility for them, and with the Lord's help, struggle to overcome them. And it is a struggle. Our reading from the prophet Amos puts the case clearly, with a painful juxtaposition of good and evil that mirrors our own experience of life. In the opening verses of the chapter, we are given a brief but beautiful visual serenade: the Lord shows Amos a basket of summer fruit. Some Bible commentators, in an effort to tie this pleasant vision in with the decidedly unpleasant accusations of sin and prophecies of doom and destruction that fill the rest of the chapter, have interpreted this fruit as being overripe and ready to rot--an image of a society that is morally and ethically overripe and about to disintegrate. And while there may be something to that metaphor, Swedenborg gives a good interpretation to the basket of summer fruit. In his posthumously published Summaries of the Internal Sense of the Prophets and Psalms, Swedenborg interprets the opening verse of this chapter, with its image of a basket of summer fruit, as being a new thing in our religious life, and as a "new church," or new spiritual stage, replacing our previous worn out and used up form of religion. And though he doesn't specifically interpret the meanings of the basket and the summer fruit in this passage, we can piece together their meaning from his explanation of parallel passages elsewhere in the Bible. A basket represents the human will, or motivation, as a container for goodness. Our spiritual summer is when we are in a phase of acting from love and kindness. And fruit represents the kind and thoughtful words and actions that we bring forth to others when we are in this state. So the basket of summer fruit that God showed Amos at the beginning of this prophecy represents the feelings of love and the acts of kindness that we become engaged in when we turn our lives over to the Lord and begin living a spiritual life. And yet, as I mentioned earlier, even when we have turned our lives over to God and have begun living in a more thoughtful, loving, and caring way, our old selfish and materialistic attitudes are still present within us, just looking for opportunities to destroy the goodness and truth that is beginning to grow in our lives. In fact, it is only when we finally start a serious effort to turn our lives around that we begin to realize just how far off the track we have gotten. It is by contrast with the beautiful basket of ripe summer fruit that the horrors following in the rest of the chapter look so horrible. We have gotten a glimpse--a vision--of a better, more loving, more spiritual way of life, and our old ways and the ways of society look all the worse by comparison. So it is intentional on God's part that the beautiful basket of summer fruit comes just before the accusations of evil intentions and behavior, and the prophecies of doom and destruction if we do not repent from our sins. When the light of divine truth and the warmth of divine love begins to shine into the shadows of our unthinking and materialistic lives, then we realize just how flawed we are, and just how much work we have to do. Then we realize that the joy of our first discovery of a new relationship with the Lord and the church must give way to the sobering reality of a lifelong struggle against our particular character flaws, our particular addictions, our particular wrong ways of thinking, feeling, and acting. Of course, God will give us our Sabbaths of rest from that struggle along the way. We cannot struggle day after day, week after week, year after year without respite--and the Lord knows this. Each of us has experienced those wonderful (but often all too brief) times when everything seems to flow: when we are getting along with the people around us, our work is going well, and we can relax and enjoy life. These times help to recharge our spiritual batteries so that we will have the energy and the will to face our next round of challenges. And the next round of challenges will come. The painful and unwelcome message of the parable of the weeds is that as long as we are living here on this earth, we are a mixture of good and evil inextricably intertwined and growing together. Each of us has our wonderfully good parts: those aspects of our personality that the people around us come to know, appreciate, and love. And each of us also has our stubbornly annoying and even destructive parts: those blindnesses and rough edges that are continually chafing against the people around us and cutting into their flesh, causing friction and pain both with them and in our own souls. Each of us has our weeds of selfishness and materialism growing up among our wheat of love and kindness. And the surprising twist to Jesus' parable is that we are instructed not to attempt to root out those weeds in our personality before our metaphorical harvest is ripe. We would think that as soon as we notice any wrong in ourselves, we should immediately and vigorously root it up and stamp it out. And often this is a good idea. Yet it some cases it can do more harm than good. Sometimes when we intend only to root out the flaws in our character, we end up rooting out our newly sprouting spiritual virtues as well. Let's use a straightforward, physical example--with apologies to those who may be struggling with this particular issue. Let's say we have a tendency to overeat, and it affects our health, our relationships, and our self-image. When we turn over a new spiritual leaf, we may say to ourselves, "This is the time to overcome my eating problem. I recognize that this is a wrong in my life, and it's time to put an end to that wrong." Perhaps we will be successful--and if so, that's wonderful! Yet especially if it is a longstanding issue with us, it is just as likely that our next attempt to go on a diet and shed those extra pounds will be no more successful than our previous attempts. If this time around we have additionally imposed upon ourselves the stricture that now that we have rededicated our lives to God, it is our spiritual duty to stop overeating, and that we are sinning against God if we don't stop it, then if and when we fail once again we could easily become so discouraged and disillusioned with our new resolve to live in a more spiritual way that we simply throw up our hands and give up on any efforts at all to move forward on the spiritual path that God has laid out before us. This would be an example of trying to root out the weeds before the wheat has grown to the harvest. Instead of being a good thing, we would have rooted out the wheat of our new dedication to spiritual life along with the weeds--and ended out with no harvest at all. So there is also a comforting side to these messages of sin and repentance. When we are faced with an obvious evil in our lives, and yet all our efforts to overcome that evil prove fruitless and it remains stubbornly rooted in our lives, this does not mean that we are forever lost, and are inevitably heading toward hell. Yes, our struggle must continue. But perhaps the meaning of our failures along the way is simply that the time is not ripe. Perhaps there are other ways we need to grow and mature within ourselves, and in our relationships with others, before we will be ready to face some of the more longstanding and difficult evils that we are involved in. Perhaps that particular weed in our personality will simply have to grow up along with the wheat of new and developing goodness in our lives. 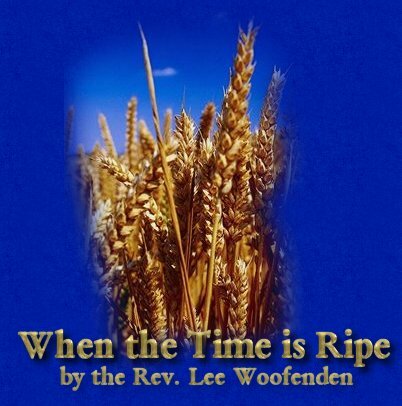 Perhaps we must await the time when both are ripe, so that the wheat in us can be harvested, while the weeds of our remaining addictions and wrong behaviors can finally be cut out of our lives and thrown into the spiritual fires of destruction. That time of judgment and sorting out will certainly happen after we die. Yet we can also look back and see those turning points when our lives shifted from one phase to another, and we left our old self behind for good. These, too, are the times of harvest. And if we continue to tend our spiritual fields, God will give us these harvests toward eternal life. Amen.